Not too long ago, the BF and I were in a lovely cheese shop around town, adorably called Cheese and Crackers, and they had a huge glass case of canned sodas. One of the varieties was Pepsi but it was Pepsi Throwback, as was the Mountain Dew. For whatever reason, I squealed in delight because nostalgia is a big part of who I am. I loved the look of the retro can and its prideful boast that it is made with real sugar; I suppose it’s the original formula. Anyhow, when I was 17/18 I used to drink full-sugar Pepsi in the can. A lot. Hey, I worked 10-hour days in retail. (Ah, to have that teenage metabolism once again.) I eventually forced myself to stop drinking it but for the time that I did, it was pure satisfaction. I don’t think the late 90s had the ‘throwback’ formula, so it’s a pretty good assumption on my part that it was made with corn syrup. One of the reasons I stopped drinking it, aside from the fact that it was sugary, was that it left my teeth feeling gritty. It’s that same feeling that prompts you to scrub your teeth to the point of wearing down your enamel. Also, I was worried I’d have brown teeth before I turned 30. Not an attractive trait. I never, and I mean never, indulge in full sugar soda anymore, as it’s all corn syrup anyway, but for whatever reason I was prompted to purchase a can, even for the mere sake of nostalgia. Fast forward a couple of weeks to last night, when I was craving a soda to go with my dinner, which was a burger ‘n fries. I remembered that I had this can in the fridge and popped it right open. I took a cold, crisp taste from the can since I am a firm believer that ice cold soda is best from a can. My first impression was that I could immediately and distinctly tell the difference between the sugar version and the corn syrup version. The soda was actually refreshing tasting and, if I may be so bold to state, tasted cleaner somehow. I wasn’t left with that gritty feeling on my teeth, even at the very end. At first I thought I wouldn’t be able to finish the soda because it contains 40 grams of sugar/carbohydrates. I surprised myself by finishing the whole thing and I still didn’t have that too-sweet aftertaste lingering. While soda has been blacklisted as of late, denounced as being the one thing that can ultimately ruin one’s health, enjoying a can or bottle every now and again is of course not the end of the world. While this is not changing my mind to suddenly begin purchasing sugar soda by the case, I would definitely prefer to enjoy this variety over the modern version. It won’t replace diet soda in my heart and, in spite of my preference of Pepsi over Coke, I have a strong affinity for Coke Zero. Perhaps Pepsi adds nostalgia to every can of their throwback soda but it really does taste better and I don’t view it as the devil-with-horns beverage that I do all the corn syrup varieties out there. Well done, Pepsi. You may be winning back a customer, albeit a sporadic one. « Oh Yes She Did. I love the nostalgia too – I miss the old cans. I also haven’t had soda out of cans for a while, though I much prefer fountain soda to can soda. 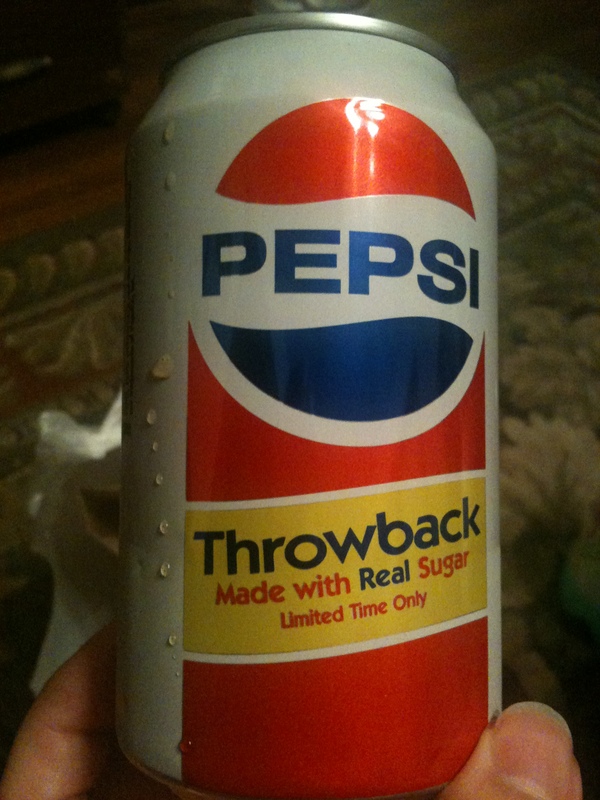 I wonder if they’ll have pepsi throwback in fountains? That could be cool – and better tasting! Zoe, I believe that Pepsi is the best thing in the world–full sugar variety. I had to give it up after my first semester of grad school–I was using the sugar and caffeine to rollercoaster the caffeine I was getting from espresso. I woke up feeling like I had no stomach left one day from all of the acid. But I remember the pepsi fondly. Do you know how many grams of sugar/carbohydrate are in the corn syrup version? Is Cheese n Crackers the place at Old Farm? I told Kevin about the shop, but I’ve never been there, I’d love to hear about the cheese (varieties, etc.–is it just 14 varieties of colby or do they have real cheese?). I Googled it. Pepsi with corn syrup has 41 grams of sugar/carbs versus the 40. But I still stand by my “cleaner tasting” observation. And lord knows what the corn syrup kind does to our bodies. Bridget, if you’ve quit smoking and eating gluten, I think you’re on a roll. You’ve earned that Diet Coke! I think Kevin would agree with you, for sure. I like a cold, glass bottle of soda, but only if it’s glass. I do love a good fountain soda but the reason I wouldn’t rank it so highly is because if the balance of syrup to carbonated water is off, even a little bit, it tastes awful. I’m with Anferny. That order is just about right; but the fountain mix has to be just about right, too. I don’t really like cans much. Whether it’s in my head or real, it seems to be more carbonated. Plus I don’t like drinking from the can (for multiple reasons). I wish I was able to taste that Pepsi, because, clearly, I’ve had it when I was younger – I just don’t remember it versus corn surrup. Ok, so I know this entry is old, but I thought of it this week because on Monday, I bought a “throwback” at the store and it took me 3 days to drink it (I cannot have that much caffeine or I’ll die)–in the plastic bottle, of course–and it was like liquid love. LIQUID. LOVE. Oh sugary pepsi, stop singing your siren song to me!